Speer Gold Dot LE Duty 223 Remington Ammo 62 Grain Soft Point ammo for sale online at cheap discount prices with free shipping available on bulk 375 H&H Magnum ammunition only at our online store TargetSportsUSA.com. 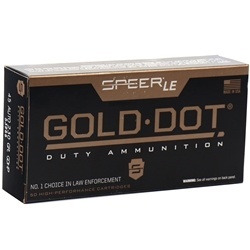 Target Sports USA carries the entire line of Speer Gold Dot LE ammunition for sale online with free shipping on bulk ammo including this Speer Gold Dot LE Duty 223 Remington Ammo 62 Grain Soft Point. Speer Gold Dot LE Duty 223 Remington Ammo 62 Grain Soft Point review offers the following information; 223 Remington ammo made by Speer is reloadable, features nickel plated brass cases and Boxer primers and this is a non-corrosive round. The Gold Dot LE ammunition goes through a process of joining the jacket and core one molecule at a time, thanks to this Speer eradicates the potential for the leading cause of bullet failure—jacket/core separation. This process will so guarantee extraordinary weight retention through barriers as strong as auto-glass. In addition to its remarkable strength, Gold Dot rifle ammunition asserts remarkable accuracy. With exact tolerances and unparalleled bullet uniformity of jacket thickness, Gold Dot rifle loads have an outstanding accuracy. Speer Le Gold Dot Duty Rifle delivers proven ammo technology to the rifle platform for each consumer. The Gold Dot bullet was the first high performance, bonded-core bullet available in handgun ammunition, and has since set the bar very high for duty ammo. These specially designed loads bring law enforcement rifle ammunition to the next level. The kind of performance that is presented with the LE Gold Dot ammunition by Speer is significantly increases the abilities of duty rifles and provides law enforcement personnel a diverse advantage when it matters most. In addition, these new loads boast outstanding feeding in short, very short and standard length AR platforms. This Speer Gold Dot rifle ammo is packaged in boxes of 20 rounds and cases of 500 rounds. Free shipping is available on bulk orders of this ammo from Target Sports USA. Muzzle Energy 1279 ft. lbs. This is fantastic ammo from a great manufacturer. I think this is one of the best self defense rounds in the civilian market for 223 Remington. I’m sure it would serve well as a hunting round as well if your state allows. There are several ballistic test on YouTube with this round. Shooting well under 1 MOA, perfect function and cycling, and compared with range ammo less felt recoil. It is in my home defense magazine. Love this Gold Dot 223 range ammo! Law Enforcement agencies, personnel and all other shooters across the world rely on Speer Ammunition when their lives are on the line. Target Sports USA carries the entire line of Speer ammo for sale online with free shipping on bulk Speer ammunition. Speer Gold Dot hollow points steel dominate the law enforcement community when it comes to getting the job done. Consistent performance and reliability proven time after time make the Gold Dot ammunition the best personal protection ammunition on the market today. 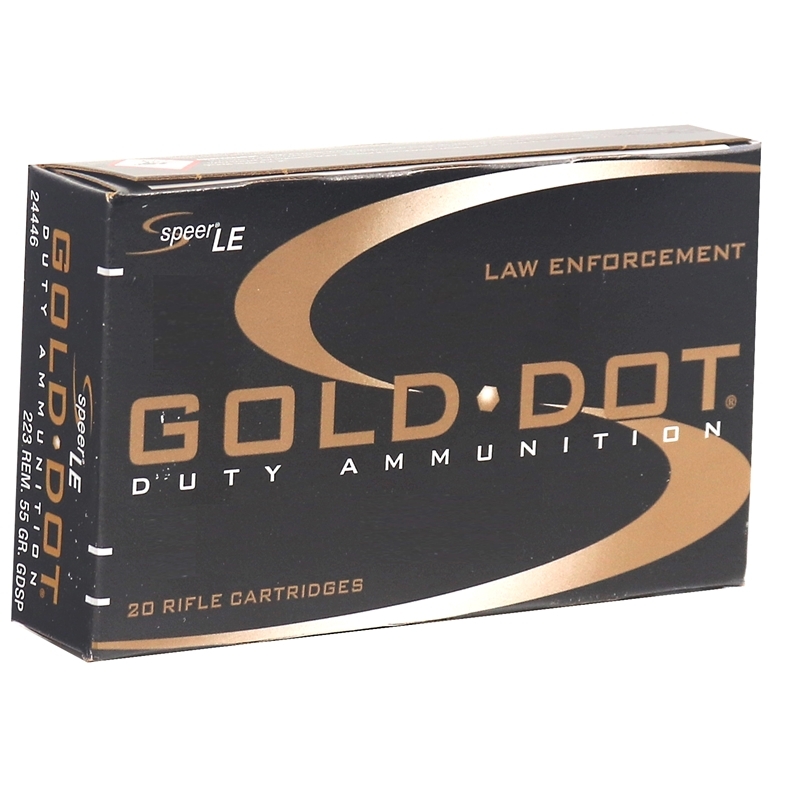 In addition to Speer Gold Dot ammo, Speer Lawman ammo offers all the quality components found in Gold Dot ammo but made for training and target shooting. In order to practice and train with the Lawman ammo line, Speer made sure that all calibers made by Gold Dot are offered in their Lawman ammo line, such as Speer Lawman 9mm ammo, Speer Lawman 40 S&W ammo, Speer Lawman 45 ACP AUTO ammo, Speer Lawman 38 Special ammo and many other calibers that are popular within the Law Enforcement Agencies. Order any case of Speer bulk ammo, receive free shipping from Target Sports USA!